Sydney Shop Girl: An Epic Miscalculation by Target. 'The Beautiful Fall' by Alicia Drake. An Epic Miscalculation by Target. 'The Beautiful Fall' by Alicia Drake. Scenes similar to this were played out across the nation this morning. Daylight saving, timezones, a quick shower, the kids, the cat and the commute were all accounted for as quite a few Missoni for Target fans settled down in front of their computers waiting for the 0800 online launch of the entire collection. A screen capture I came to know too well this morning. At first the 'temporarily unavailable' message only added to the excitement as windows were flicked between to see if the promised 'shop your wish list' email from Target had landed in the inbox and then back to the Target website just in case anything had changed. There was a glimmer of hope when the online shopping window finally opened. Then a five minute wait for a selected item to land in your basked and then nothing. That's right. Total Target Website Failure. Social media was soon awash with shoppers in a similar predicament to mine and eventually a response from Target that it had come to their attention that 'a few' customers were having online issues. Indeed. Anyway, You know what they say, if Missoni for Target can't come to the shopper then the shopper will just have to take herself down the road to Missoni for Target. Beach bags and scarves, Missoni for Target. The scarves are $49 each and are viscose (to the left in monochrome) and silk ( to the right with the peach and fuchsia border. I took both. Where things were actually rather civilised and the displays pleasingly full. I got in around 9.30am and it looked like 5 - 6 staff members were allocated to the continuous stocking and styling of the Missoni department. Long sleeved viscose cardigan - $99. The central location of the entire range made shopping a breeze. I spotted the cardigan on my wish list and grabbed the last one in my size. I also found the beach towels that I swore would be the only things I'd buy from the collection (famous last words) which were $49 each and came with a cute white holder/ strap. I haven't opened up the towels yet but they do have a pocket on them. Perfect for the pool and the beach. The clothes in general did look lovely but the patterns didn't appeal to me in real life as much as they did in the ad campaign. The tops were mostly shift like and the dresses very fitted. Styles which I find hard to work with for my lifestyle and body shape. So I saved myself the angst ridden dilemmas and Walked Away. The bangle sets didn't 'pop' as much as I thought they would in real life. A shame, really. I'm happy with what my purchases and look forward to wearing in a matter of days. Yes, I am a bit in need of this break coming up. How did you fare with today's launch? Were you in line at a store? Frustrated in front of your computer? Keeping everything or suffering a touch of buyer's remorse? From Missoni mania, to the less glamorous world of dip watch. Today's flavour was spring vegeteable and sour cream. Very nice it was too but for some reason Spring Vegetable soup mix costs 50 cents more than good old French Onion? Is it because of dehydrated spring vegetables costing more than dehydrated brown onions, perhaps? If you're a bit meh about the Missoni and dubious about the dips then perhaps you might like the book I'm reading and loving right now? Alicia Drake's 'The Beautiful Fall' was first published in 2007 but it has only just caught my attention. If you love Paris, fashion and history all in the one beautifully written book then 'The Beautiful Fall' is for you. It's easy enough to be a consumer of fashion, isn't it? You see what you like and you buy it (or save up for it). Fashion to a consumer is about personal taste, lifestyle, budget and just a little about how we want the world to see us. It's a part of our lives but not our whole lives. It's there to make us feel good. Yves and Karl out and about. But for the people who make fashion and are fashion, fashion is life. 'The Beautiful Fall' is an eloquent and considered study of the world of fashion in Paris as it revolved around the dual axes of Karl Lagerfeld and Yves St Laurent in the 1950s to the 1970s and beyond. It was an interesting period in Paris for both cultural and political reasons. The rarefied world of couture was in the midst of a dignified decline as the energy of youth and sexual liberation made its mark on Paris in the shape of adventurous young Americans and an alternate culture of beauty and daring that proved irresistible to the moneyed high society. Ready to wear was what the people wanted and this was what St Laurent and Lagerfeld gave them. They appeared to both inspire and compete with each other. Each had their own court of muses, wealthy backers, chaperones, enablers and hangers on. The two courts polarized the French fashion world but they were also responsible for some breathtakingly beautiful clothing. St Laurent appears the more mentally fragile of the two. A prodigious talent, he'd draw hundreds of pieces for each collection from which his seamstresses and pattern cutters would pick from the floor and then set to work bringing to life. One of his trademarks is the work he does with the shoulders of his designs. While others may follow trends, he would define them. Yves seemed to tread a precarious line between the structured precision of his work and the hedonistic times he spent on holiday in Africa and Marrakesh. Asia was also a big influence and when he discovered the financial windfall that is perfume licencing, his Opium perfume became one of the first huge global perfume launches in the modern world of fragrance. Some of Yves' early and iconic work. Karl Lagerfeld, on the other hand, seems to have had an eye on the marketablity of fashion from the beginning of his career. 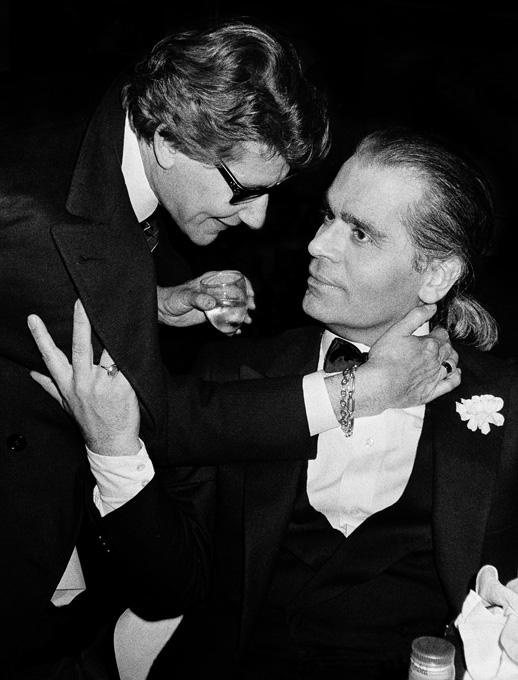 The more approachable of the two, he wasn't afraid to take on projects as an anonymous designer and is famously always available to the fashion press while St Laurent kept his distance from the world beyond his 'court' who shielded him from the harsh realities of life whilst also concealing the many harrowing episodes of mental illness he suffered between collections.. Always the bridesmaid to St Laurent's near perfect collections, Lagerfeld finally 'caught up' when he was appointed head designer at Chanel in the earl eighties. A keen scholar of Chanel's work, Lagerfeld took a few seasons to find the balance between keeping true to her aesthetic and creating visionary interpretations of it. He's my favourite couture designer of all time. I'll never own a piece of his work but I will always enjoy appreciating it from afar. Karl and some of his delectable work for Chanel. 'The Beautiful Fall' manages to be both a homage to fashion and its dedication to beauty and perfection as well as a wealth of meticulously researched 'inside' look at the scandalous and sometimes very dark other lives of these fashion icons. As the chronology of the book moves into the eighties, Drake reveals a darker side to fashion. Socialist France becomes a land that no longer seemed to smile upon the rich and elite (many of whom had fled the country to find tax havens or new fortunes elsewhere). The designs of Lagerfeld and St Laurent who glorified the female form made way for the harsh and asexual lines of Montana and his contemporaries. This bleakness was also reflected in the new direction the Parisian party scene was taking as well. The camp and flirtatious clubs of old were making way for the industrial, grungy clubs of the new guard. Am reading a book called You by Caroline Kepnes- a fatal attraction for the twitter generation. Sounds interesting. Will have a look and see if I can get for Kindle for plane. Glad you managed to get what you wanted at your local target - mine wasn't as busy as I expected, and like you noted there were lots of people around furiously restocking. I didn't get a scarf though - I was touching one hanging up and wondering what it was (no label or price) when baby T grumbled and I turned around to check he was okay, when I turned back around a lady had swooped in and gathered the whole rack up in her hands and into her trolley, haha. I had a bit of a chuckle! Now I know why I "didn't see" any scarves - I wasn't looking for them displayed like towels! Oh yes book sounds interesting! Must check it out! Thank you for your lovely comment, Mermaid. Perfumes hold such special memories, especially when bought by people dearly loved and precious to you.